Don Smith (California, United States) on 16 October 2008 in Landscape & Rural. Two old-growth Bistlecones catch the last warm light of the day in the Schulman Grove located in California's White Mountains, home to the oldest living tree the Methuselah. These trees are estimated to be over 5,000 years old, making them the second oldest living specimens on earth second only to a creosote bush in Africa. Obvioulsy having a beautiful sky helped enhance this image - one of those moments in nature where all the elements come together perfectly. 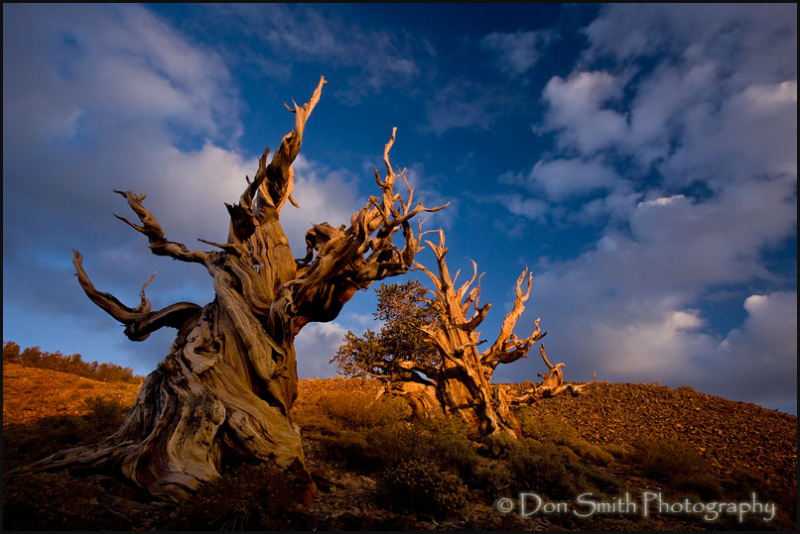 To see more of my images, please visit my website at http://www.donsmithphotography.com. The perfect image. Remarkable trees. I just got as far as the Heavens Gate image on your website. Make this the second perfect image. I asked myself how could anyone take such a beautiful image like that. amazing light in this one !! Barbara, James, Marzia, Evi and missparis, thanks you all for your nice words. Barbara, wow, "two perfect images," I wish my editors felt that way. It's really all about the light in both images. Imagine those scenes photographed in the middle of the day under harsh sun. They would still be beautiful but they would lack the impact. Thanks again! Great harmony of spectacular colours and dramatic subjects. Very, very special! Thanks Fredo, Peter and Ted. I very much appreciate your kind words. really good composition this one! i live the angle up towards the sky and the light you got in this shot - fabulous work here! Thanks Dark Elf - always a pleasure hearing from you. Wonderful shot!Great light!Love the color! Don't even have words to express, others before me have said it all....just awesome.